Interview with Dr. K.-M. Weltring, CSO, Nanobioanalytik-Zentrum Münster, spokesman of the "Deutsche Plattform NanoBioMedizin"
Prof. Dr. Harald Fuchs, director of the Physics Institute of the University of Münster and scientific director of the Center for Nanotechnology (CENTECH) has received an honorary professor from the Nanjing-Tech University in Nanjing (China). They belong to the winners of the "Jugend forscht" regional competition Münster 2015 operated by the IHK Nordwestfalen. 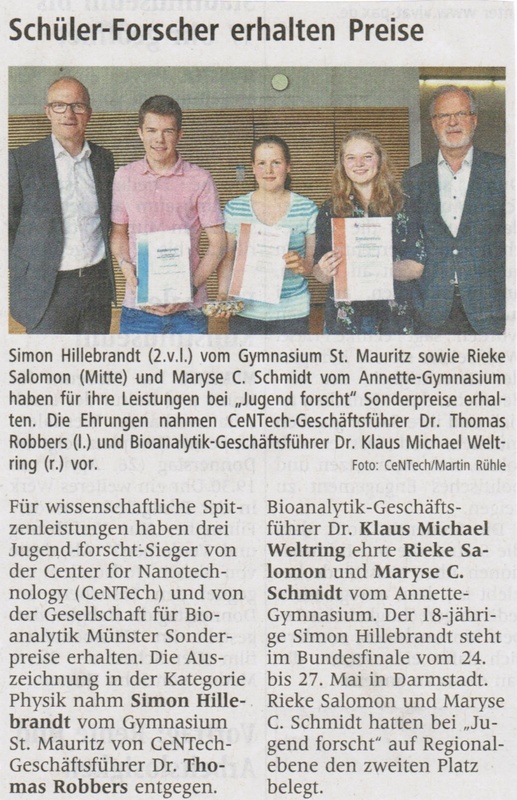 Now they have been awarded once more: Sophie Atzpodien and Andreas Bühner have received the 'CeNTech' and the 'Bioanalytik Münster e.V.' special awards for their research projects in the field of physics and biology. 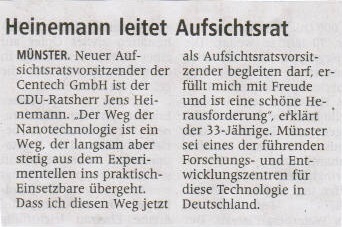 New chairman of the supervisory board of the CeNTech GmbH is Jens Heinemann, councilor of the City of Münster. He replaced Dr. Dietmar Erber, who had hold this function for more than 10 years. 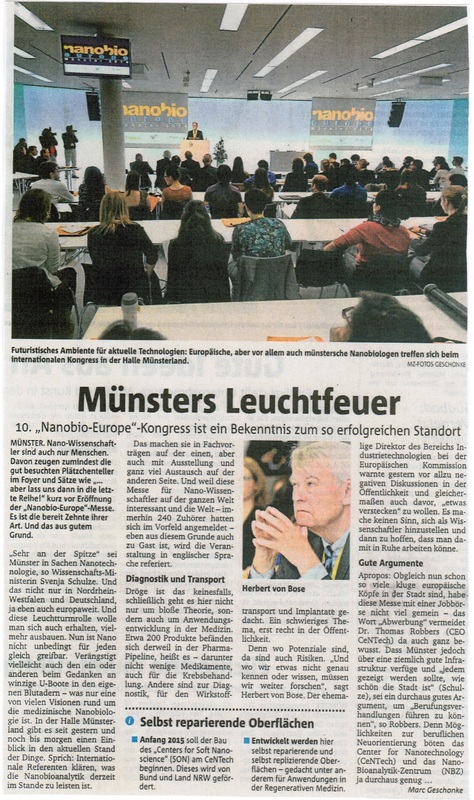 Europe's leading conference in the field of nanobiotechnology was opened by Svenja Schulze, Minister for Innovation, Science and Research of North Rhine-Westphalian and focused on medical applications of NanoBioTechnology. About 240 participants from academia and industries as well as 14 exhibitors attended the event. 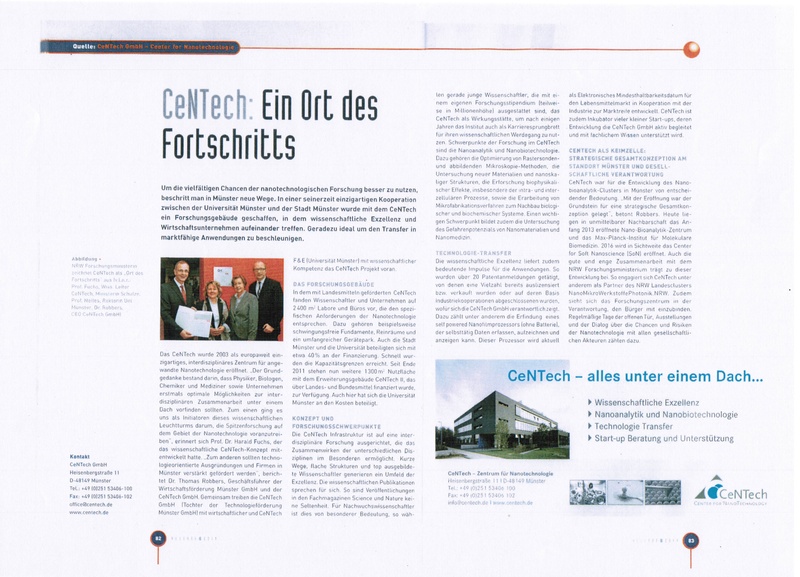 In June 2013 the CeNTech turns 10 years. For this reason we would like to celebrate the anniversary together with supporters, partners, friends, scientists and the interested public. You are welcome to join! Have a look at the detailed program which will take place from June 5 to 8, 2013. They belong to the winners of the "Jugend forscht" regional competition Münster 2013 operated by the IHK Nordwestfalen. 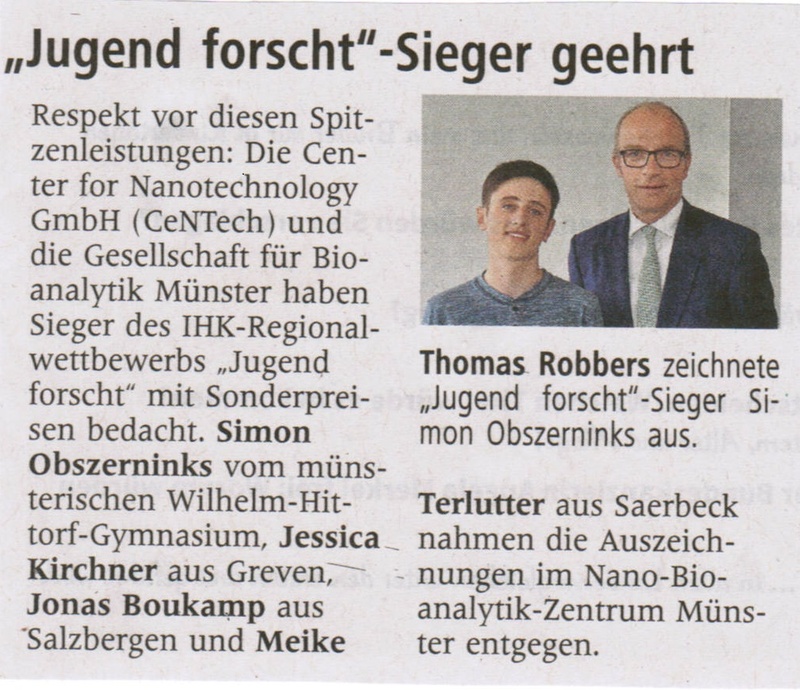 Now they have been awarded once more: selected young academics from Münsters highschools have received the 'CeNTech' and the 'Bioanalytik Münster e.V.' special awards for their highly interesting research projects in the field of physics and chemistry. 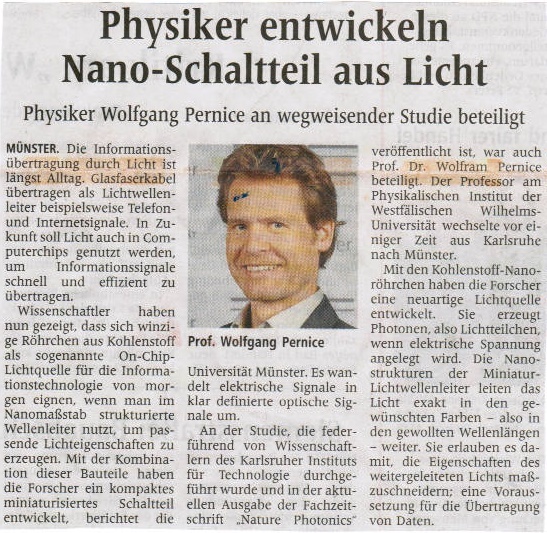 CeNTech Scientist Prof. Meinhard Knoll has been awarded the Innovation Prize IT 2012 of the Initiative Mittelstand for the development of a novel RFID Nano processor. This Nano processor is integrated into a passive RFID system, thereby opening up a number of new innovative features. 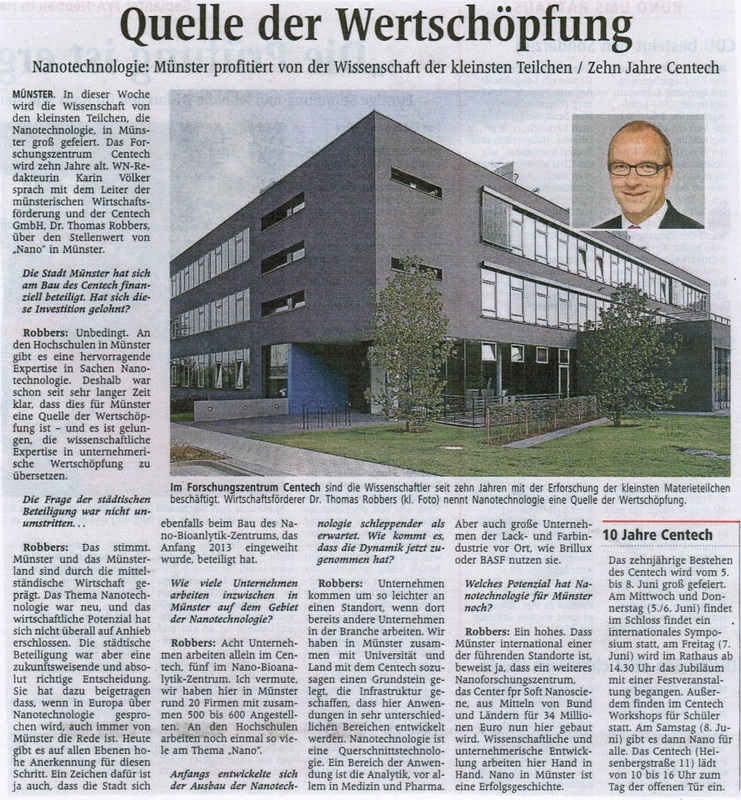 CeNTech is been awarded as 'Ort des Fortschritts' (site of progress) by the North Rhine-Westphalian research ministry. 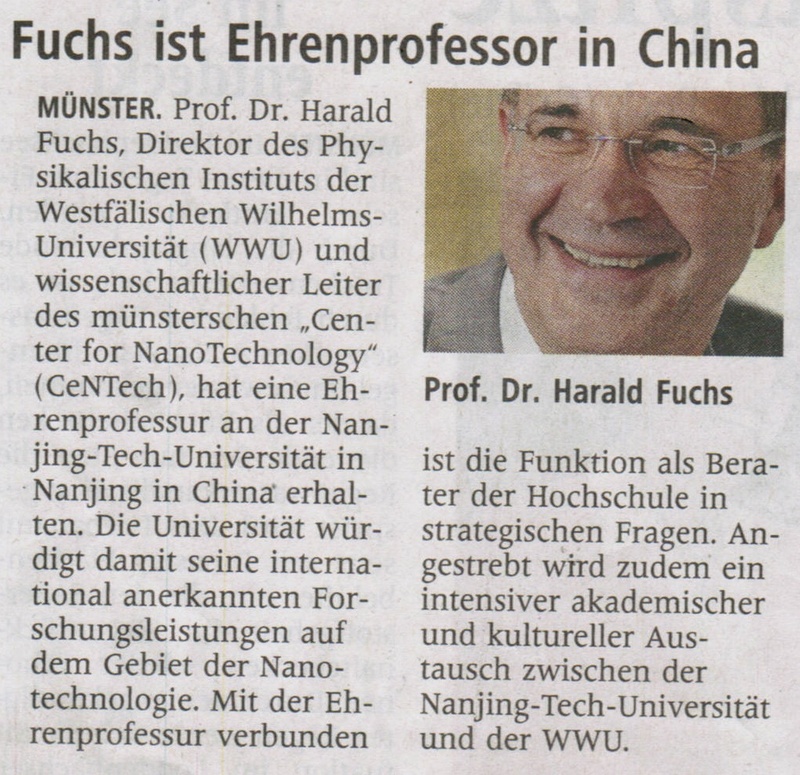 CeNTech scientist Dr. Kristina Riehemann is the German head of the nano project MINAC, an international German-Chinese research cooperation, that has lately been granted by the BMBF with 2,7 mio . Subject of the project are the possible risks if nanoparticles in connection with medical application. 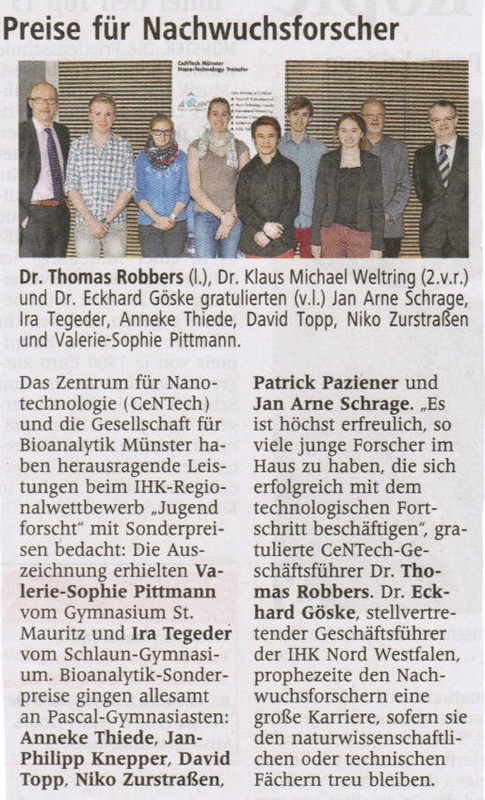 To discuss the future nano strategy of North Rhine-Westphalia the NRW Ministry of Science invited 9 nano experts - among them the CeNTech director Prof. Harald Fuchs . 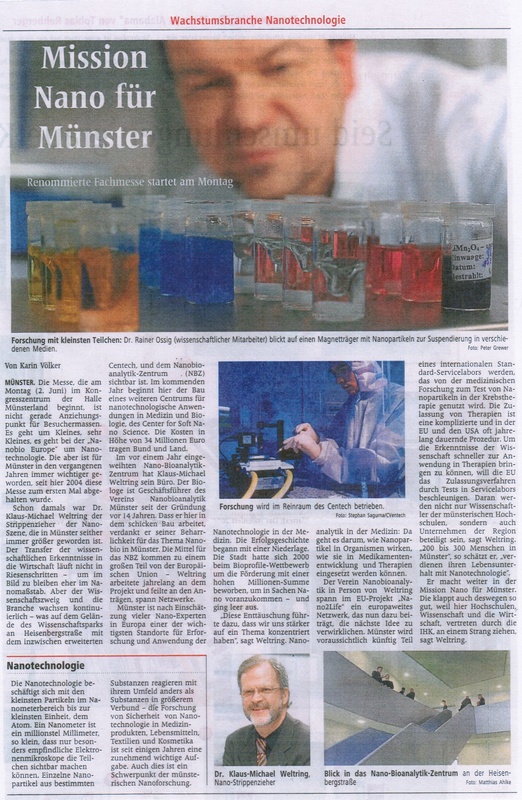 Since years scientists from Münster are busy establishing contacts in Russia. Among them the CeNTech with several perfomances at Russian exhibitions. 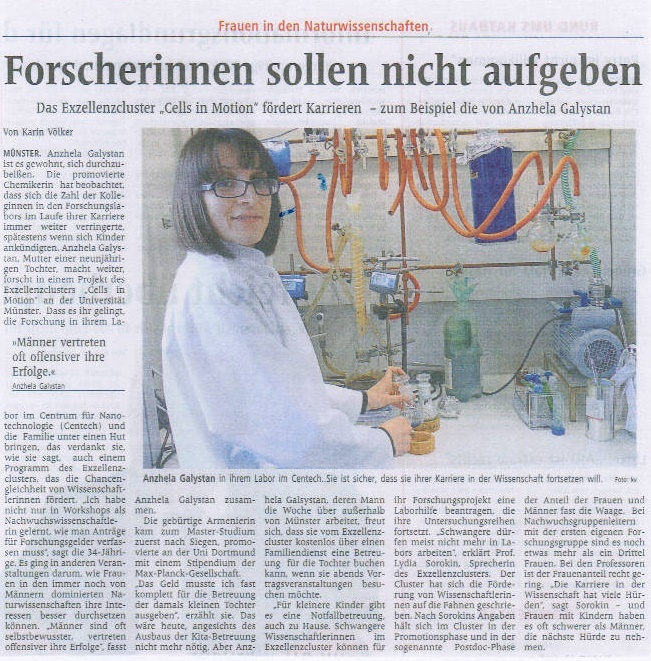 Latest success: A Russian pharmaceutical company moves into the science park of Münster. 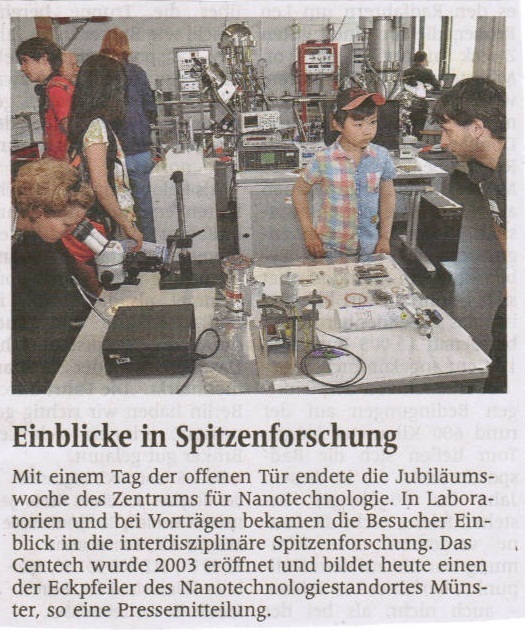 Not only at the science park of Münster but also at this year's Hannover Messe they are neighbours: the CeNTech and the Nanobioanalytik Zentrum (NBZ). 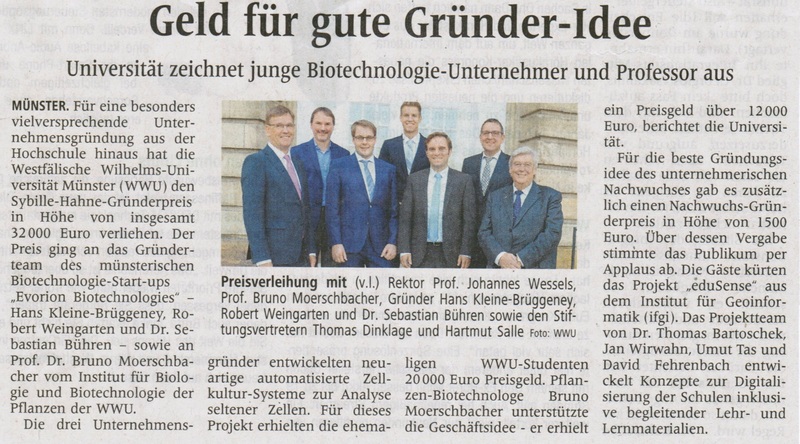 The CeNTech is looking for investors who are interested in a promissing invention, the NBZ GmbH for NanoBio companies that fit well into the infrastructure of the centre, which will be completed in 2013. 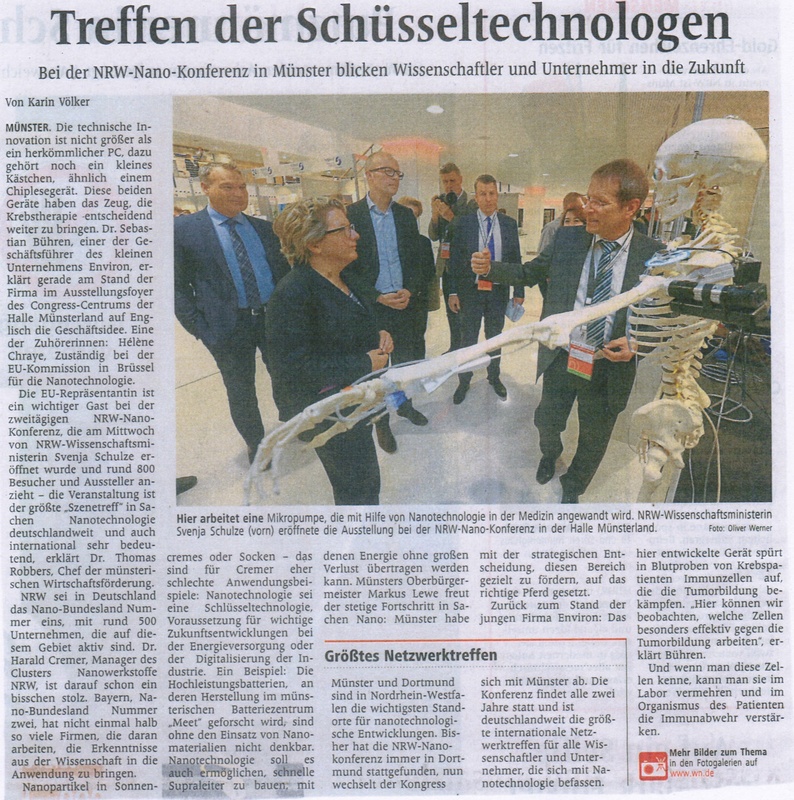 Prominent guests were welcomed at the CeNTech booth at this year's Hannover Messe. The North Rhine-Westphalian economics minister and the research minster showed their interest in the CeNTech activities. 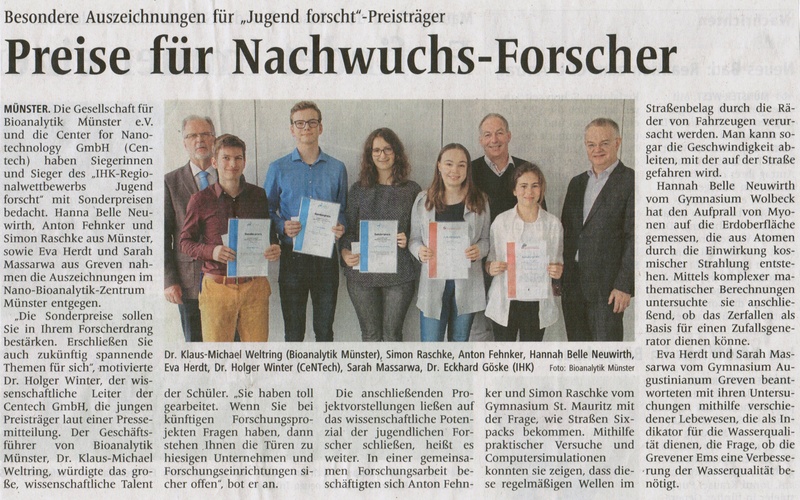 Annually the CeNTech is awarding a special price in 'physics' to one of the winners of the 'Jugend forscht' regional competition organized by the IHK Nord Westfalen. This year's laureate was Benedikt Decker, Münster, whose research is dealing with an alternative energy source to common batteries. 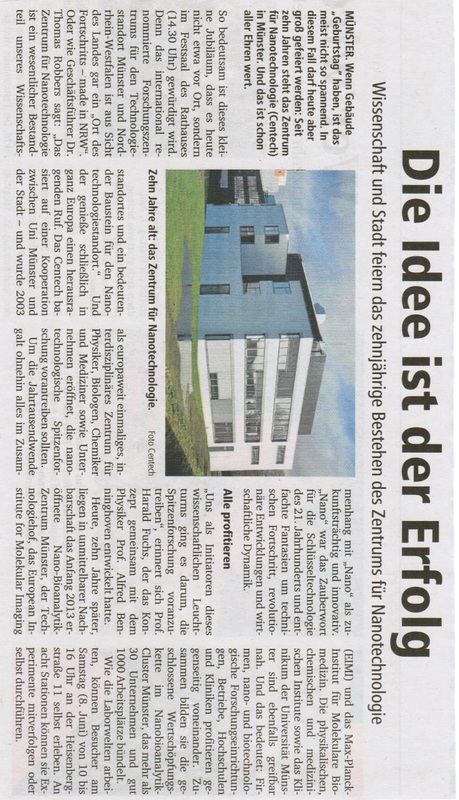 For about 5 million Euros a new research building is built in the Heissenbergstrasse 11. 40 scientists will get here the "most modern terms of employment for top research". The 3-storey building which is connected about a bridge with the existing CeNTech I shall lure young scientists with new ideas to Münster. Main Research in the new building are the production of organic and inorganic Nanomaterials for new illuminants. 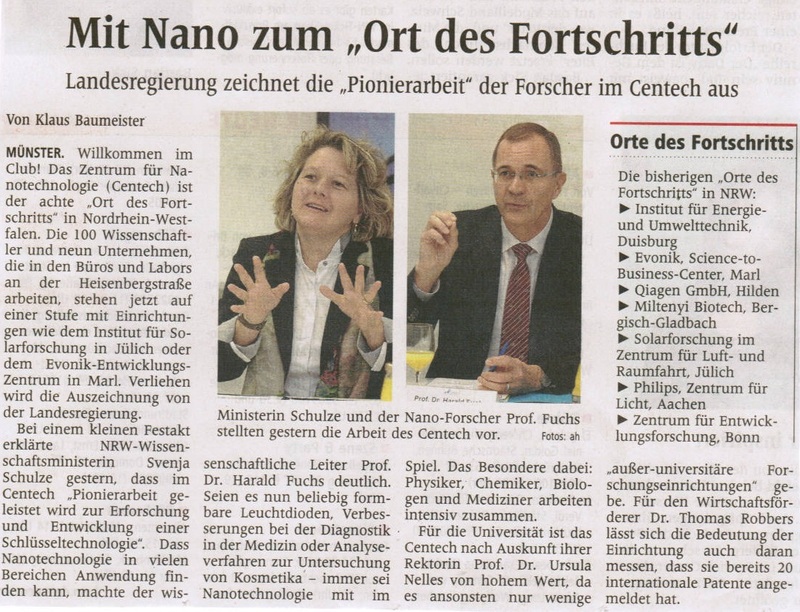 The CeNTech II shall strengthen the international research in the area of Nano-Analytics and Nano-Biotechnology. The 2003 opened CeNTech, in which 8 research groups of the University of Münster and 9 companies are working, has become too small. Therefore, the CeNTech II is built directly next to the CeNTech I during the next 12 months. On 1300 square metres labs are built for 40 scientists. The first costs amount to about 7 million Euros  the country North Rhine-Westphalia and the German government's second stimulus package make 5 millions available, the other 2 million Euros come from the University of Münster. 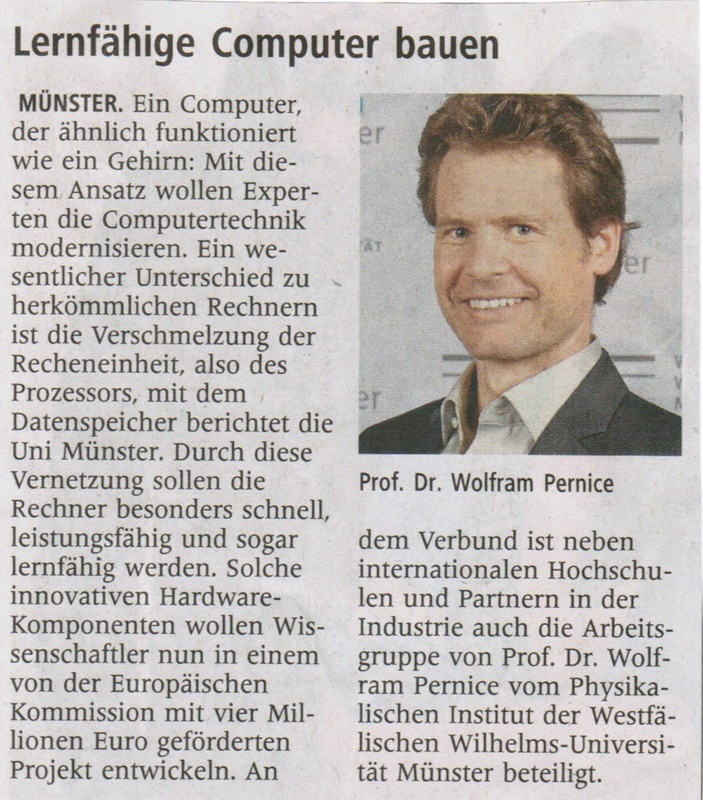 The CeNTech II shall strengthen the research location Münster even further. The 6. 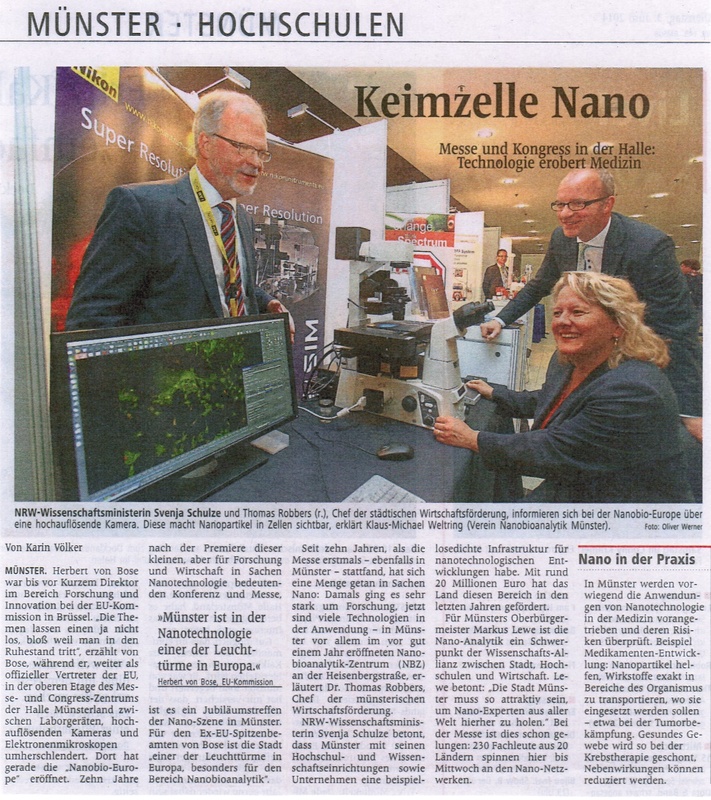 NanoBio-Europe conference was opened in the Halle Münsterland. Even the US-American ambassador in Germany, Philip D. Murphy, visited the event and showed that the USA and Germany are the most important partners in the technology development. But outstanding scientists in the area of Nanobio-Medicine like Mauro Ferrari from Texas were also present. A pivotal aim of the research in this area focuses on drug development for cancer therapies. Nevertheless, the nanotechnology offers not only infinite possibilities, but also potential risks for environment and health must be considered like Antje Grobe of the Risk Dialogue Foundation illustrated. At the 6. NanoBio-Europe conference Dr. Antje Grobe of the Risk Dialogue Foundation (St. Gallen) gave an interview about the advantages and disadvantages of nanotechnology. In 2008 the last survey was executed in Germany. At that time 80 percent of the interviewed person evaluated nanoproducts positively, nevertheless, they mentioned risks for health and environment. But a general statement whether nanomaterials are dangerous or safe can Dr. Grobe not make. As a result she indicates that always the isolated case should be tested. In 2009 three big projects were finished which have to be evaluated now. At the same time a new project which deals with the environmental safety started. Yesterday began the three-day NanoBio-Europe conference in the Münsterland Halle. About 300 researchers from different disciplines discuss during the next days how nanotechnology can be used in the medicine. Cristian Strassert is one of them. He has developed together with Prof. Luisa de Cola and five other scientists of the Center for NanoTechnology (CeNTech) Nanoparticles which could help to carry medicaments thus in the body that they reach their aims directly and release no side effects. Martin Stremmel, sales representative of the company Nikon, which is also located in the CeNTech, presents at the accompanying exhibition microscopes that makes single cells visible. Thus small things become visible and more and more things possible. Some of it are at the moment still dreams of the future and ignites presumably the one or other discussion at the conference. 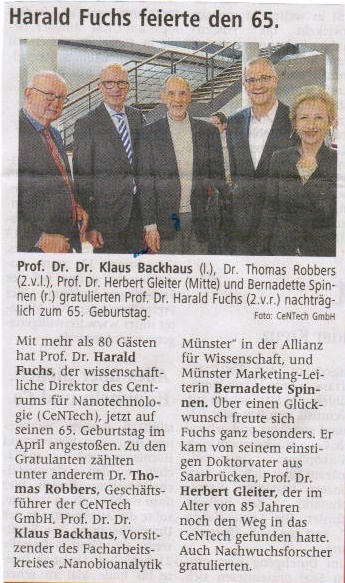 The Federal Minister of Education and Research Annette Schavan visited the labs of the CeNTech. The idea of the CeNTech originated in 2003 from a competition of the federal research ministry has turned out as very successful. Therefore the building has become too small and thus an extension is built. 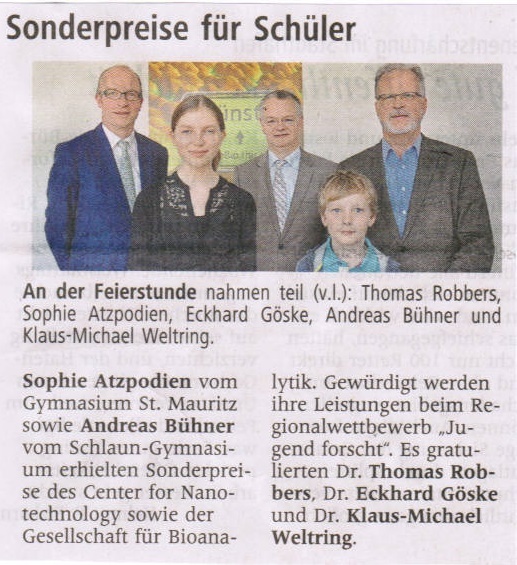 The new building is paid predominantly with means of the economic stimulus package and should strengthen the whole region Münster in the area of nanotechnology further. NRW-SPD top candidate Hannelore Kraft visited West Lotto at the Weselerstrasse. In form of a talkshow Reinhard Münchenhagen asked the questions and Hannelore Kraft answered and, besides, revealed some private details. 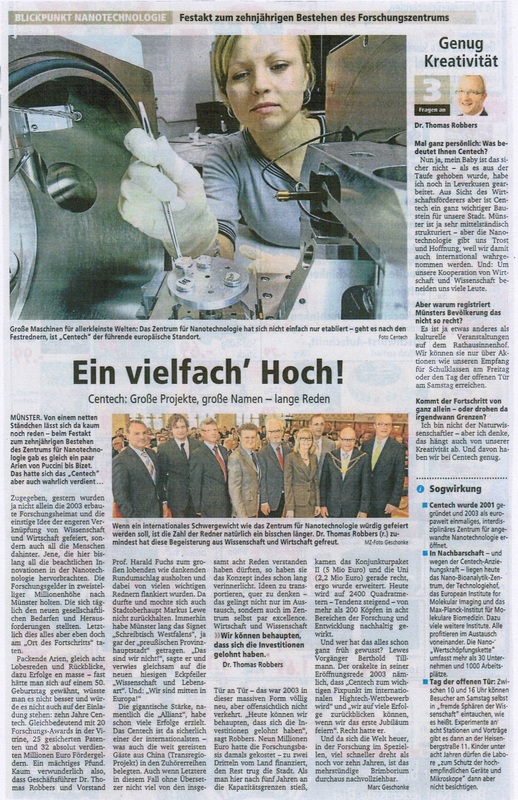 Yesterday Hannelore Kraft had worked within the scope of her tour "Tatkraft" in the technology park at Carpegen. After the work she presented her programme "Von Mensch zu Mensch" at Westlotto.